Nintendo's well and truly on the ball this week, Europe, bringing us our download news nice and early. This week sees the Wii and DSi rejoin the party with 3DS, while Wii U drops out for a bit of a rest. The offerings include a recently unveiled game from 3DS Direct, as well as a long awaited retro adventure on WiiWare. Let's get to the details. Splash or Crash (Nintendo, €2.99 / £2.69) — Known as Kersploosh in North America, this title tasks you with guiding a variety of objects — ranging from pebbles to jewels — down a well safely while avoiding various obstacles. It sounds simple and slightly bonkers, but at a budget price may be an attractive option; we'll work on our aim, find the nearest well and get a review to you soon. 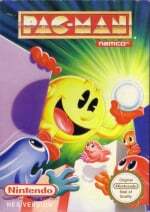 Pac-Man (Namco Bandai, €4.99 / £4.49) — This NES version of the title makes its way to 3DS in Europe after its November eShop appearance in North America. This NES port of the arcade classic is thoroughly competent, and the 3DS version has the benefit of portability and the included two player mode, making this a better option than the Game Boy equivalent — check out our Pac-Man review for the full lowdown. Easter Eggztravaganza (Microvalue, 500 Nintendo Points) — It's a seasonal mini-game collection with a superfluous "z" in the title, so this one may be met with some trepidation. Clearly targeting children, there's a back story about painting eggs, visiting the shops and family before embarking on an egg hunt, so we can expect spot the difference and colouring-in games to feature. We'll be stuffing our faces with chocolate eggs and reviewing this for your pleasure in the not too distant future. 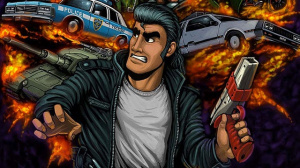 Retro City Rampage (Vblank Entertainment, 1000 Nintendo Points) — This one was on the "delayed for so long it'll probably be cancelled" list for a fair amount of time on WiiWare, and yet it now graces the Wii (and Wii U's "Wii Mode", don't forget) with its brand of pixel-based pop-culture old-skool GTA mayhem. 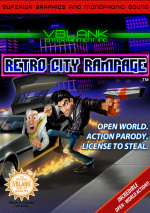 Critically acclaimed by some on other systems, this WiiWare version will also include ROM City Rampage, a version of the game constructed as if to actually run on the NES. We'll start causing chaos on the streets in the name of bringing you our review. Reel Fishing Ocean Challenge (Natsume, 500 Nintendo Points) — Another entry in the sports fishing-sim, this is a series well-known to Wii veterans. This entry carries on in much the same vein as its predecessors, but we feel that poor motion controls, disappointing visuals and ill-advised paid-DLC let this entry down — our Reel Fishing Ocean Challenge review has all the details. So there you have it, a couple of relatively high profile releases on 3DS and Wii accompanied by some retro arcade action, seasonal mini-games and an iffy fishing simulation. Let us know which of these will be emptying your virtual accounts this week. Nothing for me this week by the way. Splash and Crash is not worth €3,- for me. Maybe 1 or 2. Has anybody ever voted and you're not from the region? Just curious. I just did. It felt so wrong, I don't think I'll ever do it again. Nice to know keraploosh will be cheap. Will download Splash or Crash if it's any good, and that'll do it for me this week. I'm interested by Splash and Crash (Almost misspelled it Slash and Crash... whoops!) so I'll be waiting for a review on that. Why is EU getting Kersploosh! a week before NA gets it. They got the Castlevania: Mirrior of Fate demo last week and NA is now getting the Castlevania demo this Thursday and Kersploosh! March 7th. I don't mean that NA should get things first I just wonder why Kersploosh! can't come out for both EU and NA the same week. Looking forward to a Splash and Crash review. I had originally looked forward to Retro City Rampage, but based on what I've seen and read about the game I think I'm going to pass. I'm really considering Retro City Rampage as I haven't downloaded any other version yet. I'll definitely get Splash Or Crash too, and NES Pac Man at some point in the future when there's nothing else to get that week (though that's really not high on my list of priorities). I hope Europe gets the updates for Ice Climber and Yoshi soon. A teasing week, no must-have (at least for me), but few titles that sounds interesting. I'll pick up Splash or Crash & Retro City Rampage eventually. I am not downloading anything this week except for my second Wii to Wii U transfer. Bit scared of losing some data and/or purchases but, after having so much fun with the SNES version, I want to get F-Zero X on my Wii U!!! Damn are we never going to get Cave Story+? Is Yatagarasu still in development? Like, what the heck happened? Whilst I appreciate the 3DS VC being alive, I do wish we could get something other than NES games all the time. Perhaps it is because we have Fire Emblam and Europe won't see that until April. Seven days isn't as long as a two month wait like they have. Splash or Crash and Retro City Rampage for me. Very sad that Runner 2 and the Star Wars DLC for Zen Pinball 2 aren't coming the same day as on other devices. Retro City Rampage is far too late for me to bother I'm afraid. I'm just not buying anything from the Wii Shop on my Wii U. I can't even be bothered to launch the Wii Channel! so no further discounts on 3DS games then... can't say I'm surprised that much! If Retro City Rampage wasn't is WiiWare title it would get infinitely more sales. E-Shop that baby, please! I might get Pac-Man at some point, I'd be more likely to if it gets a discount at some point though. Last week was great. Unfortunately it seems that's not going to happen that often. Nothing for me. I'll just wait for Mirror of Fate. Oooh I hope Kersploosh will be coming to the US soon then! I'll admit right here, as my first contribution to the site's weekly European eShop update, that I voted "nothing for me this week", but that wasn't out of dickery. In fact, I'm sure something awesome will come out pretty soon. Then again, if only Nintendo bowed down to the requests for a GBA VC... but I'm afraid that handheld won't see a digital reincarnation on 3DS SD Cards before 2014 at least. Harmoknight, now that caught my attention when I saw a gameplay trailer. Might get that for sure. Where is runner 2 ??? Again no Shock Troopers 2. Will this ever be released in Europe at all at this point? I'm always looking forward to the weekly update only to be disappointed every time. Ha ha ha ha ha ha! Pac-man!! 3DS just became a little more epic. Also, Splash or Crash looks good. Waiting for the review! Nothing for WiiU this week... I'm going to buy Splash or Crash! Come on Nicalis, you gave us Night Sky, can we get some Cave Story+ now? Please? Some NES GTA action for me this weekend, finally. Saving my cash for HarmoKnight. Quite interested by Retro City Ramgape and Splash or Crash. Pacman is a great game, but i already have the GB version on 3DS VC, and then Pacman & Galaga Dimensions (3DS), so I really don't need the NES version as well. Nearly £5 for an old port of Pac-Man? They're 'avin a laugh! Final Fantasy XII, BOXBOY, SteamWorld Quest! Mortal Kombat 11! SteamWorld Quest! Dragon's Dogma! BOXBOY + BOXGIRL!